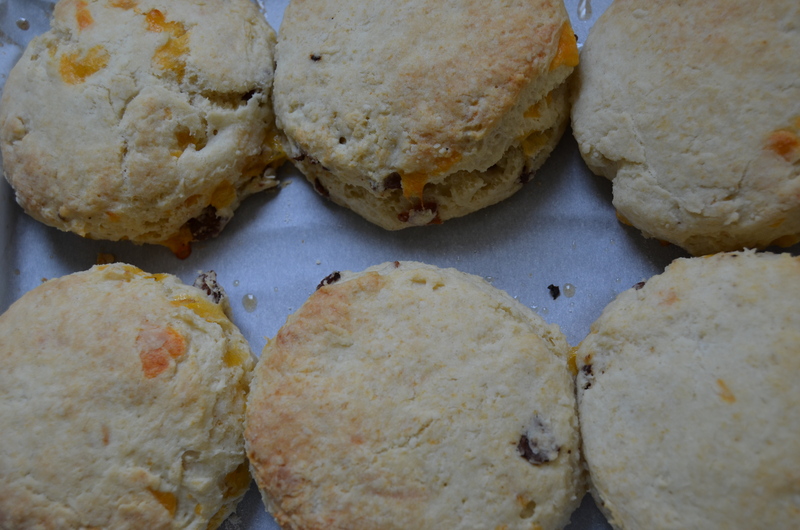 The addition of bacon makes anything better and biscuits are no exception. This recipe has just enough bacon so that it doesn’t over power the flavor of the biscuit. I like anything spicy so I decided to make a jalapeño butter but added a little honey to sweeten things up. This biscuit is great for breakfast, but also great for lunch or dinner with buttermilk fried chicken! Preheat oven to 425. Dice bacon and cook until crispy. Drain on a paper towel and set aside. In a medium bowl, whisk together dry ingredients. Cube the stick of butter and add it to the dry mix. 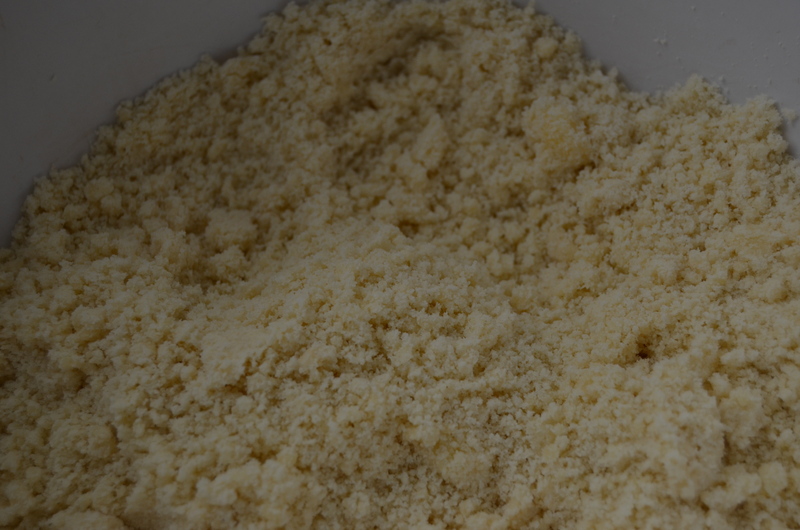 Cut butter into dry ingredients until it resembles fine crumbs. I like to use my hands for this but you can also use a pastry cutter. Mixture should look similar to the one below. Add 2/4 of the buttermilk and gently fold in. If mixture is too dry continue to add the remaining 1/4 of buttermilk until mixture just comes together. If mixture is still too dry after final addition, add buttermilk a little at a time until dough forms. Fold in cooked bacon and cheddar cheese. Place dough on a floured work surface and press out flat then fold dough over in half. Press dough flat again and fold over to help create a flaky texture. If dough seems sticky just dust with a little flour. Press dough flat to about 1/2 thickness. Cut biscuits to desired size. I used a 3 inch cutter which yields 6 biscuits. 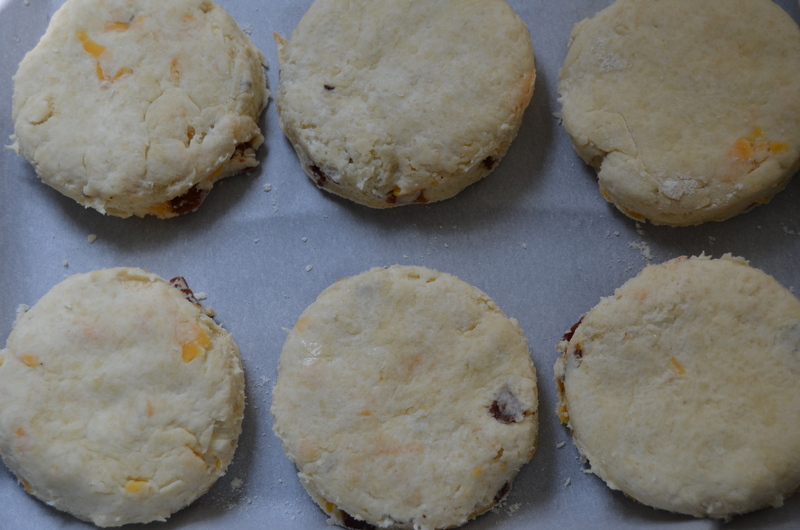 You will need to combine the scraps at least once after you cut the first batch of biscuits and re cut. Place on a baking sheet lined with parchment. You can also use a cast iron skillet if you like. I like to leave a little space in between each biscuits, but if they touch, don’t worry they will still come out great. The edges will just be a little softer. Place biscuits in the freezer for 10 minutes. Melt the 1 tbs of butter and brush the tops before placing in the oven. You can also try sprinkling tops with additional shredded cheese. Bake on 425 for 15-18 minutes until tops are light brown. Place jalapeño over open flame on your stove top and completely char on all sides. Place jalapeño in plastic bag for 5 minutes. Remove and scrape charred skin off. Finely dice jalapeño and add to softened butter along with honey. Stir to combine. Serve with warm biscuits. i was about to try this 2 seconds after reading this post, but i do not have buttermilk at the moment so i will hold off. Trust this will be included in my next sunday brunch.